Out of time and place? Swindle City, here we come! The Tour de France is kicking off as a write this, and I've already settled in for extended periods of watching. One change for this year is that I can now follow it on my iPad, which is yet another progression in spectator technology. In the 1980's I followed via print media, in the late 90's by TV, then 10 years later on my laptop via things like Google Earth, and now via tablet computing. While it makes viewing easier, I wonder if it is actually taking me further away from the event. What I mean is that I am interacting with a model of the race, rather than the race itself. Of course this is also because I am here in Australia, rather than in Belgium (for the first three stages), and this is how information is being increasingly presented. I've also noticed this starting to apply to chess tournaments as well. With the development of live game broadcasts there is a growing proportion of the chess public who think that presenting online games is the major function of a chess tournament. While it is something that adds value and publicity to an event, as a priority it still ranks below making the tournament a success for those who actually play or spectate in person. Indeed, if it was just about watching online, then I could organise a number of cheap tournaments, which entirely consisted of computer v computer games being shown on the web. But where would be the fun in that? A new tournament has been announced for next month in Amsterdam, titled the "Golden Classic". The unique feature of this event is that it will have adjournments after the first playing session, with the game to be completed on the rest days. This is a return to an earlier time where 5 hour playing sessions were the norm, rather than the 'play until finish' system we have now. I for one was a little sad when adjournments began to disappear, and I argued strongly for the retention of adjournment regulations in the Laws of Chess at the 2008 FIDE Congress (They were kept in the rules btw). In my earlier days as an arbiter, I had to handle a few of them, and while they were mildly irritating, I still felt they were a legitimate part of them game. Of course they did create the odd headache, especially when players would claim wins based on incorrect procedures from their opponents ('K-Q7 you say. There is no Q file on the board and I claim the game'), or simply argue over the venue and time for the resumption of the game. What I suspect we will see from this tournament are 3 things. Firstly, there will be some games where the players will deliberately mark time until the end of the session. Secondly, the quality of the endgame play after the adjournment will be quite high. Thirdly, there will be more drawn games amongst the games that go past move 40. Further details and discussion of this tournament can be found here at Chessvibes. Of course one of the games I now have is "Video Chess" which was designed for the Atari 2600. As with most chess programs I find in the wild, I gave it a workout on the easiest level, and I must say that it is better than most. However I am a few moves away from checkmating it (taking a break to type this), in a game that has probably lasted around 25 moves. There are two interesting artefacts from that era that are apparent in the modern version. Firstly the user input is really klunky, as you have to move a cursor around using a simulated joystick, and use the button the select the piece. The second is that when the computer is thinking, the screen flashes different colours, and the board disappears. If I remember correctly, this is because the 2600 only had so much memory, and the memory normally used for the screen was needed by the program to work out its next move. To follow up my review of the Maroczy book on Morphy, I'd like to highlight a game from early on in Morphy's tournament career. It was played in the first round of the first American Chess Congress, but what struck me was not Morphy's play but that of his opponent. James Thompson played a Sicilian Defence, long before it was fashionable, and played it in a thematic manner. Of course the usual defensive lapses of the time were present, but Morphy still had to work hard for the win, and do so in a manner which is far more 'modern' than his more famous victories. There was no direct attack on the king, rather a battle over open files, the seventh rank and passed pawns. In the end Morphy won because he was able to transform positional advantages into a winning ending. And all this in 1857! A few years ago I made a couple of posts on the topic of 'playing while sick'. Having come done with a mild cold over the weekend, I thought it was time to revisit the topic. Having roused myself from my deathbed I played Kishore Sreetharan in round 6 of the Belconnen Club Championship. Since the start of the year Kishore and I have played a few tournament games, which usually ends with me escaping from a near terminal position due to one saving trick. However this time I decided to be a little more aggressive out of the opening, which kind of fits in with 'how to play when sick' method. (For those who don't know it usually involves chucking pieces up the board). This time it actually turned out quite well, and I even got to demonstrate one of my other mantras "If you play Nce4 then you should have a winning attack". It turned out it was not so much a winning attack, but a good position with a material edge. But it was enough to win, although I nursed it home towards the end, rather than trying to find any forcing wins. Of course this is not conclusive proof that being a 'little sick' assists your chess by making you either (a) reckless or (b) careful (I managed both a various points), especially as my opponent was suffering from a similar malady to mine. There have been a number of books written about Paul Morphy but what may be the best of these has not been available in English until now. Paul Morphy: A Collection of His Games with Detailed Notes was written by Geza Maroczy in 1909, but was only published in German. A little over 100 years later the first English translation of his work is available, from ePlusBooks. ePlusBooks produces electronic chess books for the iPad/iPhone/iPod with the emphasis on providing an interactive reading experience. Along with the text, each of the games can also be followed on an electronic chess board, which is part of the reading software. For this book on Paul Morphy, the feature is a real bonus. Geza Maroczy put a huge effort into researching and producing this book, as it contains 408 games. More importantly he has annotated each of these games, including the games right at the end of his career against his friend Charles A. Maurian (played at Knight odds). The book is divided into chapters the focus on a significant periods or tournaments in Morphy's life, and Maroczy provides the historical background to each event. On the great controversy of Morphy's life, his non-match against Howard Staunton, he is reasonably circumspect, simply laying out the facts as they were then known, without attributing any supposed motives to Staunton's behaviour. One of the great things about this book, is that Maroczy clearly devoted himself to the task of explaining as much of Morphy's play as possible. In his forward he states "I have striven for a correct and economical review of them that is not stingy with praise but which also does not skip lightly over mistakes ..." As the book was written over 100 years ago there is obviously no reliance more modern tools (ie computer software), or even a reliance of previously published works. This allows Maroczy to approach everything with a fresh eye. Overall this book is a fantastic collection of games played by one of the great figures of chess. Not only can it be read for enjoyment, it can also serve as an excellent teaching tool, with many of the lessons from Morphy's games still relevant today. It is available through the e+Chess Books app for iOS (iPad/iPhone/Ipod) for around $16 (Aus). If you have so far been reticent to spend some of your cash on chess books on the iPad, I would strongly recommend you change your mind and grab this book. Despite not being able to attend this years Chess Olympiad GM Zong Yuan Zhao provided some stiff competition for those who are. He has just finished first in the 2012 Gold Coast Open with 5.5/6. Along the way he beat WIM Emma Guo, IM Aleks Wohl and drew with IM Moulthun Ly, who are all off to Istanbul in two months. There was a 4 way tie for 2nd, with Ly, IM Stephen Solomon, FM Max Illingworth and FM Gene Nakauchi finishing on 5. This years event was FIDE rated for the first time, although this necessitated the top section being reduced to 6 rounds. However, even with a 57 player field, it looked as though the leading players did meet when required. Overall the event attracted 137 players which I believe is a record for this tournament, and yet another Australian weekender comfortably moving past the 120 player mark. One of the problems of playing lots of repeated tournaments is that you may end playing the same players over and over. This was raised as a concern at Street Chess today, with the observation that first round opponents, and even key opponents, tend to repeat during a rating period. This is not necessarily a new problem as a number of years ago the Canberra Chess Club experimented with 5 week events, but strong players found it annoying that they often had to play the same lower rated opponent every 6 weeks (ie in rd 1 of every event). One solution is to experiment with various random swisses. The simplest way is to simply allocate the seeding numbers randomly, and pair from there. Another possibility is to try alternative pairing systems. I previously posted about the New Zealand Chess Federations 'Reverse Pairings' method, which I since found out was invented to combat exactly this sort of problem. I've since been made aware of another system, the 'Italian Swiss' (or 'Clock Swiss'), which was a form of random swiss in the 1970's. As the 'Clock Swiss' is being presented at the upcoming Swiss Pairings Programs meeting in Istanbul (although in a more structured form), I will probably try and run at least one tournament with this system before the meeting. I don't expect it will result in too many bizarre pairings, but it may mix things up enough to placate the murmurs of the Street Chess crowd. While reading a random discussion on the English Chess Forum, I stumbled across a suggested line against the Evans Gambit. At first it looked so unbelievable, that I began to think it just might work. After 5.c3 Black just leaves the bishop hanging on b4, and hits back in the centre with f5! Although it was played over 100 years ago, credit for its rediscovery goes to the Geoff Chandler and Paul Cooksey on the RedHotPawn website. The only game in Megabase that I could find was a win by Blackburne against NN in a simul, put there are a couple of more games, and a discussion of its history here. However, rather than pass off untested goods to the readers of this blog, I did feed the position into one of my engines. While ancient wisdom had that taking the bishop was risky, the materialistic computer thinks that this is the best. After 1.e4 e5 2.Nf3 Nc6 3.Bc4 Bc5 4.b4 Bxb4 5.c3 f5 6.cxb4 fxe4, 7.b5! is the right continuation, as 7. ... exf3 8.Qxf3 keeps White ahead on the material ledger. Based on that I am loathe to recommend it for anything other than blitz or rapidplay, and obviously only as a surprise-surprise weapon. Why the double surprise? Simply because the Evans Gambit is once again rarely seen in the wild, even at the usual hack-happy club level. So it may be a while before you get a chance to play it. A number of years ago I had a post which listed some of the music which Paul Dunn and I used to play on the Sunday night radio show we hosted in Canberra. With the arrival of Spotify I revisited the post to create a playlist of most of this music, or at least those songs that are available on this music service. Recently Spotify added a 'Radio Station' feature, which I am still trying to work out. It seems that it takes a playlist, and then chooses other songs that match the theme/style/artists on the playlist. I assume it has a number of algorithms that do this matching, and most of the suggestions seem fairly thematic. There of course may be some voodoo involved as well, as it keeps tossing up 'Golden Brown' by the Stranglers, which I don't believe was ever played on the show, but is one of my wife's favourite songs. However there is the occasional song which doesn't seem to fit, unless I do a little bit of extra digging. It seems that it isn't just the style of music that is considered, but also the album/single artwork. So every now and then there will be a band who decides that putting a chess board on the cover of their album carries some gravitas. And that is how they slip into my headphones. After 1.e4 e5 2.Nf3 Nc6 3.Bc4 Nf6 4.Ng5 4. ... Bc5 is normally a forced win for Black. However there are players of the Black pieces who want chess to be more of a challenge than that, so alternative moves do exist. One rare move in this position is 4. ... Nxe4 Now the intent is pretty clear, in that Black is either hoping for 5.Nxe4 d5 or 5.Nxf7 when either 5. ... Qf6 or 5. ... Qh4 can be tricky. It also serves a a bit of a surprise weapon as often White knows there is something wrong with it, but they just can't remember what it is. This seemed to be the case at the ANU Chess Club this evening when one of the games on the Winter Rapid began this way. White had a bit of a think, but eventually found the one sequence that gives White better chances. 5. 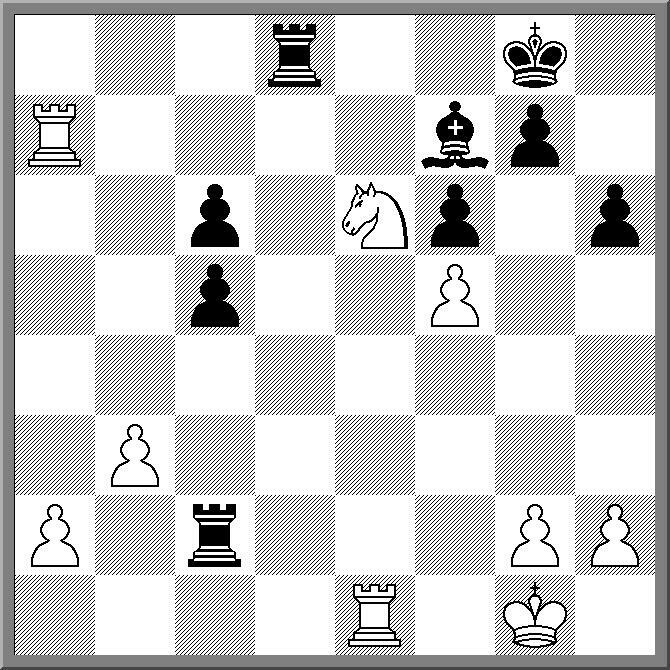 ... Bxf7+ Ke7 6.Nxe4 (The sneaky 6.d3 has also been played here) 6. ... Kxf7 7.Qf3+ and even if Black does not fall for 7. ... Kg8?? 8.Ng5! then White should be fine. Played some chess, had a draw, now trying to wind down. But in trying not to think about chess, I find I have nothing to blog about. So all that is left is this self referential post! Once again Magnus Carlsen scores the points when needed. He got off to a slow start in the 2012 Tal Memorial, but by remaining undefeated, we was able to keep touch with the leaders as successive front runners got cut down. The in the final round he defeated Luke McShane, while the previously out of sorts Lev Aronian did him a huge favour by defeating Fabiano Caruana. This leaves him in outright first on 5.5/9, a score which disguises how hard fought this tournament was. Caruana still finished on +1 (5/9) which can be considered a 'breakthrough result' for him, while Luke McShanes -1 can still be considered a +, especially given his wins over Aronian and Kramnik (See the game below for example). Despite reaching 50% Aronian had a sub-par performance, while the Nakamura fanboys will have to wait another year. The 2012 ANU Chess Festival runs from the 27th of July to the 3rd of August 2012. It starts with the traditional simul at King O'Malley's on the 27th July (4:30 pm start), and contains the ANU Open, as well as the ANU Primary & Secondary Schools Championships. Last years tournament was a great success with 81 players taking part. Such was the significance of the tournament we even had world No 2 Lev Aronian as an interested spectator. So if you intend to play, get your entries in early, as a help to the organisers (of which I am one). 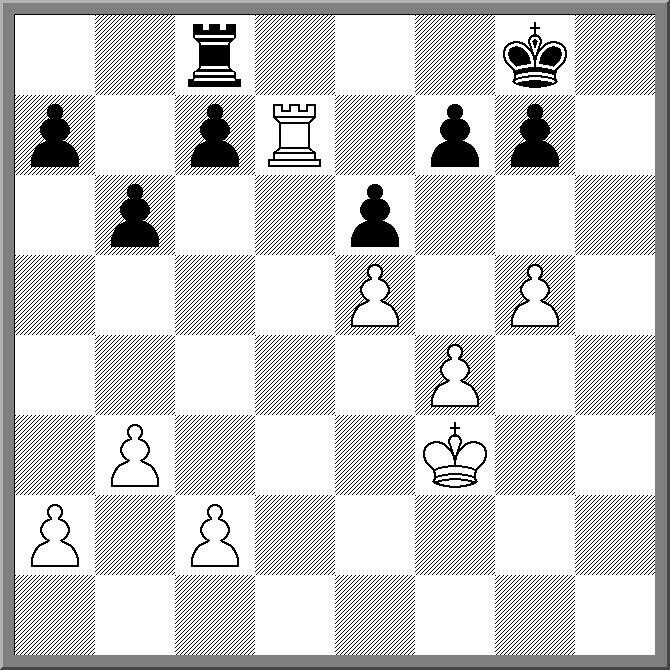 Compare and contrast the position after move 15 with the remainder of the game! One of the things that the FIDE Rules and Tournament Regulations Commission is working on is a glossary of terms to make the Laws of Chess a little clearer. However we realise this will take some time, and is currently a work in progress. One thing we will try and avoid is having something that reads like this. A month or so ago I volunteered for the role of publicity officer for the ACT Junior Chess League. In part this was because the job was vacant, but also because I wanted to carry out a little experiment. Having hovered around the edges of media for a number of years (magazine editing, radio presenting), I knew that often the media is willing to run stories, if they are (a) interesting and (b) written by someone else. So in my new role I try and send out one press release a week. I normally do this on a Monday and it goes to the various newspaper, radio and television outlets in Canberra. It is a single page press release and focuses on a different chess story each week. Sometimes it covers an event, and other times it deals with a specific player. The idea is to get the local media used to the idea that there is always something 'happening' on the local chess scene. So far the take up rate has been pretty good. I've sent out 4 press releases and they have generated a number of stories. The two most popular ones concerned Emma Guo being picked for the Olympiad, and Andrew Brown winning the NSW Open. The Andrew Brown story seemed to resonate well with the local media, as I played up the "Canberra player beats Sydney's best" angle. So I suggest that this is a strategy that can be copied within any chess 'market'. Media contacts are not hard to find, and once you have a mailing list, just send them something new or significant each week. As long as they can ring you back, you should generate plenty of stories. I had a pretty grumpy day at work today, as I had a number of problems I was unable to solve, for various reasons. So I headed off to the chess club in a less than stellar mood. As one of our long time control tournaments had finished last week, it was an evening of blitz before the next tournament began next week. Normally blitz is a bit hit and miss with me, but tonight it was mainly hit. I ended up scoring 7/9, losing only to Kishore Sreetharan, who ran away with the tournament, scoring 9/9. Of course I had plenty of luck along the way, as the diagram will show. My opponent (who is free to name himself in the comments section btw), passed on Bxe6 and instead went for the 'positional' Rdd2. After Ra8+ Kh7 Nf8+ it suddenly dawned on him what had just happened. So a combination of a good score and good karma, meant that my bad mood had faded away, and I went home feeling a lot better. As I mentioned in an earlier post, I had hoped the organisers would be providing English language commentary. It turns out that they are, and the commentator is Australian GM Ian Rogers. He is doing it kind of tough, as his commentary studio is located some distance from Moscow (in Sydney actually), so his office hours are from 9pm to 4am! The live coverage can be found at www.chesstv.com It is video feed only (with an analysis board), so if you want to follow all the games, open the tournament website in another window and watch them side by side. The 2012 NSW Open has been won by IM Andrew Brown. Going in to the final day with a half point lead, he looked to be in trouble against GM Zong Yuan Zhao, but a careless move by Zhao allowed Brown to execute a stalemate trick and save half a point. He then defeated IM Stephen Solomon in the final round, in a tricking RvB and pawns ending, where Solomon is usually in his element. As a result Brown ended up on 6.5/7, half a point ahead of GM Zong Yuan Zhao and IM George Xie. In the Under 1600, Canberra junior Tomson Qin fulfilled his pre tournament boast of 'winning $1000', by scoring 6/7 and taking outright first. He had a little luck along the way, with his 6th round opponent offering a draw despite being on the right side of Q+R v Q ending, due to worries about his time. He wrapped out outright first in the final round with a quick draw after his closest rivals also drew. Day 2 of the NSW Open is always the toughest for the players, as it usually involves playing 3x4hr+ rounds, with very little downtime in between. Of course some players are happy to avoid this punishment by taking a half point bye in the 5th round, but despite the temptation, a large percentage of players decided to play all day. At the end of the 5th round, the outright leader in both events are from the ACT! IM Andrew Brown scored two good wins in rounds 4&5, beating IM Gary Lane in the afternoon, and IM George Xie in the evening. He is half a point ahead of FM Max Illingworth and GM Zong Yuan Zhao, who both conceded draws in round 4. Tomorrow mornings round sees Brown up against Zhao, while Illingworth will play Xie. In the Under 1600 tournament, Tomson Qin leads with 5/5, half a point ahead of Matthew Stewart. The two are paired tomorrow, and as Stewart took a half point bye in the 5th round, it may provide a data point in the debate about whether a half point bye is a hindrance or a help. The best way to describe the first day of the 2012 NSW Open, was that is was 'technically difficult'. Not for the players, who tended to stick to the task of playing chess, but for the arbiters and organisers. Getting the event underway on time was the first challenge, with a number of walk-up entries resulting a fair bit of entry list juggling and updating. Once play did start, the live game uploads refused to behave, which meant more trouble, especially as I managed to break the tournament website while trying to solve the problem. Having eventually repaired the damage, and getting the broadcast working, the internet connection at the venue went down in flames, resulting in most of the second round games freezing around the 10 move mark. Apart from that, the 144 players who entered the tournament did actually get to play their two rounds today. The Open section ended up with an impressive 92 players, with no upsets on the top boards. This means that the top board pairings tomorrow will see a number of clashes between the top seeds and up and coming junior players. The Under 1600 tournament ended up with 52 players. With the smaller field only 10 players made it to round 3 with a perfect score. Unlike the Open, the bunched nature of the field makes a likely winner harder to pick, although somewhat surprisingly, it is the more experienced players who make up the bulk of the leading pack. Full results and pairings for the Open are available at http://www.chess-results.com/tnr74946.aspx?lan=1 Parings and result for the Under 1600 will be available when the last of the website issues are resolved. I'm heading off to Sydney early tomorrow morning for the 2012 NSW Open (as an arbiter). Since its breakthrough year a few years back the entry numbers for this even have made it the number 2 weekender in Australia, after the Doeberl Cup. This years sees a larger than usual international entry, with players who played in the Asian Seniors & Amateur Championships staying on for a few extra days to also play this event. Earlier this evening there were around 130 entries in the Open and the Minor, and with walk-ups tomorrow, it will go close to breaking the 150 mark. We hope to broadcast at least 6 games from the Open each round, at the tournament website. I'll also try and keep up a steady stream of results via twitter etc, as the internet connection at the venue, Parramatta RSL Club, is normally pretty good. First round is at 12 noon tomorrow (9th June) with the tournament running until Monday afternoon. The top section will be FIDE rated, with GM Zong Yuan Zhao the top seed. The ACT Interschool Teams Championship kicked off today with the North Canberra-Gungahlin Primary School Zone Championships. The event saw Amaroo School host 41 teams, with around 170 students taking part. The tournament was won by the Turner Red Volcanoes, who finished on 21.5/28, winning 6 of their matches, and drawing 1. Tied for second on 20/28 were the Emmaus Hermit Crabs, and Ainslie Gold. These teams, plus the next 6 to 8 teams, qualify for the final of the ACT Primary Schools Teams Championship which will be played in term 3. Despite the size of the field (the largest ever hosted by Amaroo School), the event was the smoothest I have run in recent memory. The whole tournament was played in good spirits, and I did not have one serious dispute to deal with this year. The kids seemed to enjoy themselves, whether they were winning or losing, and given the number of tournament flyers collected at the end of the day, hopefully a new wave of enthusiastic junior players will be starting more substantial chess careers. Despite the late start in accepting registrations, the 2012 Olympiad is now up to speed, with a total of 154 countries on the entry list. The deadline for registering teams is in the next few days, and at last count very few FIDE members remained un-registered. If you are interested in seeing which countries are registered, as well as some team lists, then http://register.chessolympiadistanbul.com/countries is the link to click. At this stage the list of team members is incomplete for most countries, as the deadline for registering players is a month away. Nonetheless there are a few teams in the Oceania region who have already put their teams up (eg PNG , Australia, Palau). For me this will be the first time I will not be going to the Olympiad as player since I first represented PNG in 2000. I've been appointed as one of the members of the Technical Administration Panel, which handles the tournament pairings, and so have stood down from the PNG team. iPad's are good for a lot of things, but heavy duty chess work is not necessarily one of them. There are number of chess playing programs available (I have stockfish on mine), and a few eBook apps devoted to chess (e+Chess Books another that I use). However the most common question asked of me concerns PGN readers. As with most things in the iPad world, there are a number of apps you can purchase. As with most things in the chess world, most people don't want to do that. So the real question is: Is there are free pgn reader? The answer is yes, a couple, but the quality varies. But if you want a simple, free reader that works, then Chess Viewer from Everyman Chess is the one I use. While it is designed to enable you to view ebooks you purchase from them, it also reads standard pgn files.Loading them onto your iPad is fairly straightforward, as long as they are available on the web (you specify the web address of the file). After that you can select games to play through, and it even handles sub variations etc. The only drawbacks for a players point of view are (a) no analysis engine and (b) no editing or data entry capabilities (it is just a game viewer). So, this package is best for playing through games from tournaments etc. If you are looking for something that will do prep, post game analysis etc, then the first place to look is in your wallet. The diagrammed position was one I used in a small coaching group on the weekend. The players were quite young (9/10 years old), and the purpose of the exercise was demonstrate the power of a rook on the 7th rank. In the exercise they took turns at playing the position against each other, both as black and white. Despite imperfect play from both sides, the fact that White won most of the games showed just how good his position is. However, one thing I realised from watching my students in action, is that patience is a skill yet to be developed. Not once did the player with the black pieces attempt to drive the rook away with Kf8-e8. Instead there were a number of desperate pawn thrusts on the queen side, which usually resulted in the White rook getting to b7 or a7 and winning a couple of pawns. 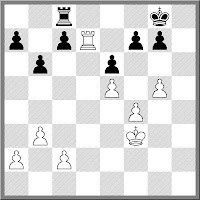 This of course meant that White was never asked to find 1.g6! 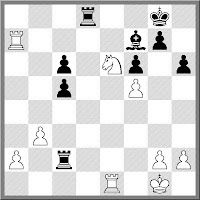 as the best move in the position, with the most popular choice being 1.Kg4. What I suspect might happen with this group of players (or any similar group of that age) is that while winning games using direct threats of mate or material wins will of course be satisfying, it will be the first player to discover the secret of defence who will move ahead of the pack. Regular contributor to this blog, Milan Ninchich, alerted me to a collection of training material that is available from the FIDE Trainers website. It consists of a number of articles (or surveys) written by various FIDE trainers, and is free to download and use. The articles for 2012 are available separately, while articles from previous years are collected in the Yearbooks from previous years. The direct link to the articles is http://trainers.fide.com/surveys.html and while mainly geared towards coaching stronger players, it may also prove valuable to coaches working with players of any level. I suspect one of the reason why the calendar for top level chess seems o crowded is that there are plenty of organisers still willing to hold such events. The World Championship match has just finished, but the Moscow will see another event beginning at the end this week, the 2012 Tal Memorial. The top 5 players (according to the Live Rating List), Carlsen, Aronian, Kramnik, Radjabov and Nakamura are all in the field, along with Caruana, Morozevich, Grischuk, Tomashevsky and McShane. The 10 player round robin starts on the 7th June (with a blitz event to decide colours! ), and runs until the 19th. I'm assuming that the tournament coverage will be almost as good as the WCC (live video commentary!? ), although for now the only link to the tournament I've found is http://russiachess.org/ which is of course in Russian! As for tournament tips, Carlsen and Aronian to battle it out for first, Caruana to be the surprise packet, and McShane to play the longest games of the tournament!